Throughout the 19th century, Egypt was considered to be nominally a province of the Ottoman Empire, although both France and Britain worked to assert influence and control in the country. Isma’il Pasha was a young man when succeeded his uncle as Khedive (Viceroy) of Egypt in 1863. Isma’il presided over the country as it was ushered into the modern industrial era. He was responsible for many governmental reforms, and he oversaw the development of a vast railroad system, supported the completion of the Suez Canal, and greatly expanded the cities of Cairo and Alexandria. His tenure was also marked by the construction of lavish palaces, and he became known for his extravagant entertaining and support of the arts, including his commissioning of Giuseppe Verdi’s opera Aida. In Europe, the sustained interest in Egypt during the 19th century came to be known as Egyptomania, and it followed the 1798-1801 campaign of Napoleon into Egypt. Egypt’s influence on European literature, art and design continued to grow. In the second-half of the 19th century Khedive Isma’il used the melding of Egyptian and European aesthetics to reinforce powerful political connections. A remarkable example of this was a porcelain table service that Isma’il commissioned for formal state banquets. The service may have been commissioned on the occasion of the Ottoman Sultan Abdülaziz’s recognition of Isma’il’s family as the Egyptian line of succession. The full service was created at the Ginori factory in Doccia, Italy from 1873-76. Gaetano Lodi, an Italian painter and ornament designer, was commissioned to design the Egyptian-inspired ornamentation for the service along with the interior decorations for the royal palace in Cairo. This drawing by Lodi for a surtout de table, a magnificent centerpiece, incorporates panoply of Egyptian motifs, including the hieroglyphic ankh in the lower right corner, as well as the flying birds and stylized lotus forms. The color scheme is reminiscent of enameled and gold Egyptian jewelry. Two hippopotami are used to support the compote, an allusion of prehistoric Egyptian artifacts. But the basic ceramic shapes are derived from traditional European forms, making Lodi’s design a remarkable example of the influential exchange of ideas and inspirations between Egypt and Europe in the realm of decorative arts. Caitlin Condell is Assistant Curator in the Department of Drawings, Prints & Graphic Design at Cooper Hewitt, Smithsonian Design Museum. 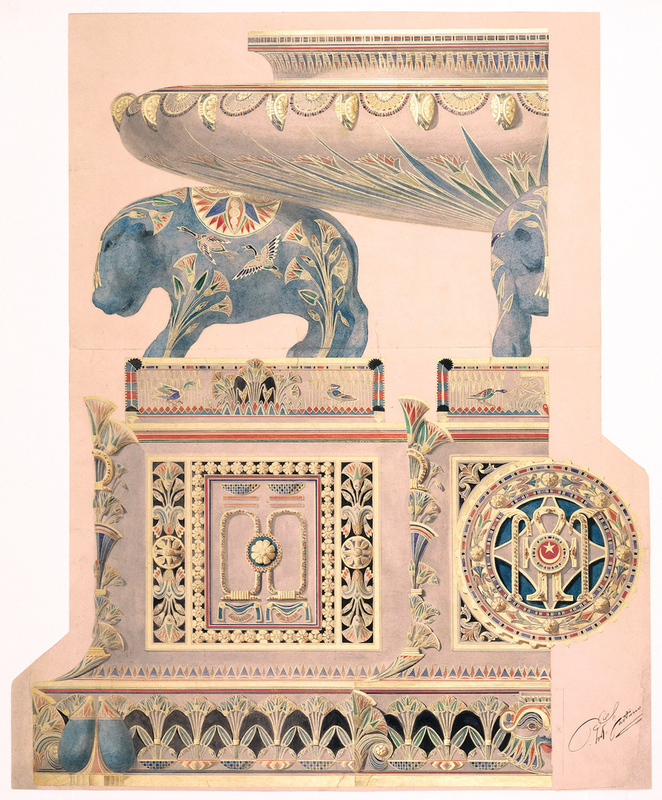 Drawing, Design for a Surtout de Table, for State Porcelain Service of Ismail, Khedive of Egypt, 1873–76; Designed by Gaetano Lodi for Manifattura Ginori (Dorria, Italy); Brush and watercolor, gouache, gold paint, black ink and wash, traces of graphite or black chalk on heavy tan wove paper; Museum purchase through gift of Levy-Hermanos Foundation, Inc. and Henry W. Safran Foundation, Inc. and from Friends of Drawings and Prints and Drawings and Prints Council Funds, 2000-8-1.